It was well beyond fashionably late to begin. 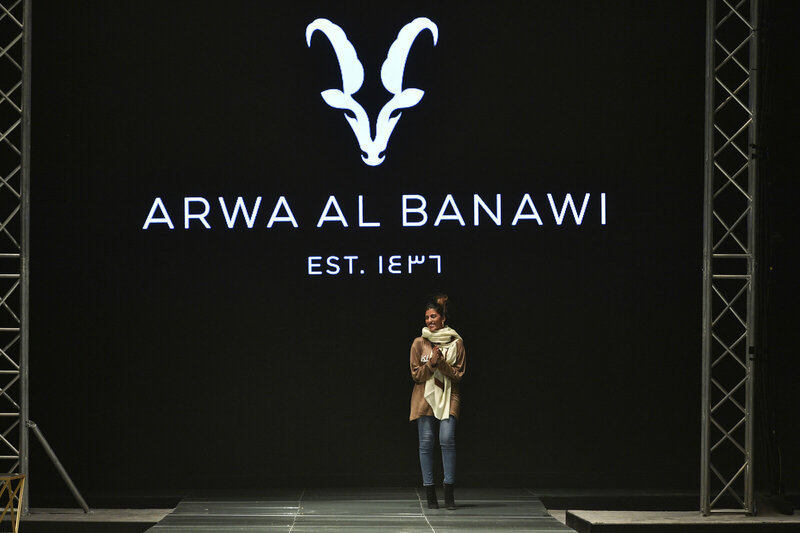 But models finally took to the runway on Thursday in Saudi Arabia’s first-ever Arab Fashion Week. The event is one of the new entertainment opportunities opening up recently in the ultra-conservative kingdom. The fashion show hit significant delays, with logistical problems forcing it to open two weeks later than planned. 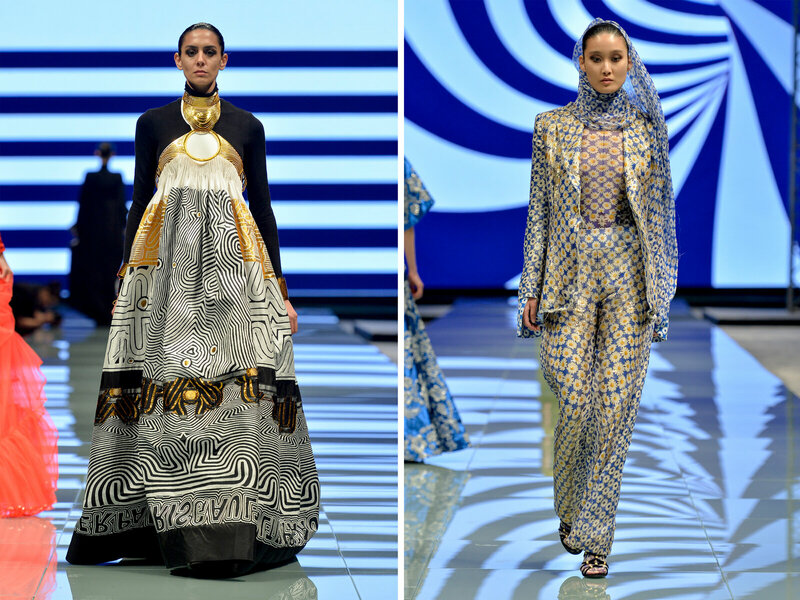 Designers and models had trouble getting travel visas, and the organizers had to change venues to tents on the grounds of the Ritz-Carlton hotel in the Saudi capital Riyadh. As the event got underway, the backstage area was cramped and frenetic. Makeup artists and hairstylists worked their magic on the mostly Russian and Eastern European models, and designers made last-minute adjustments on their garments. The first gowns by designers like Lebanon’s Tony Ward and Bibisara from Kazakhstan were ultra-feminine — with long trains and an emphasis on sequins, feathers and beads. 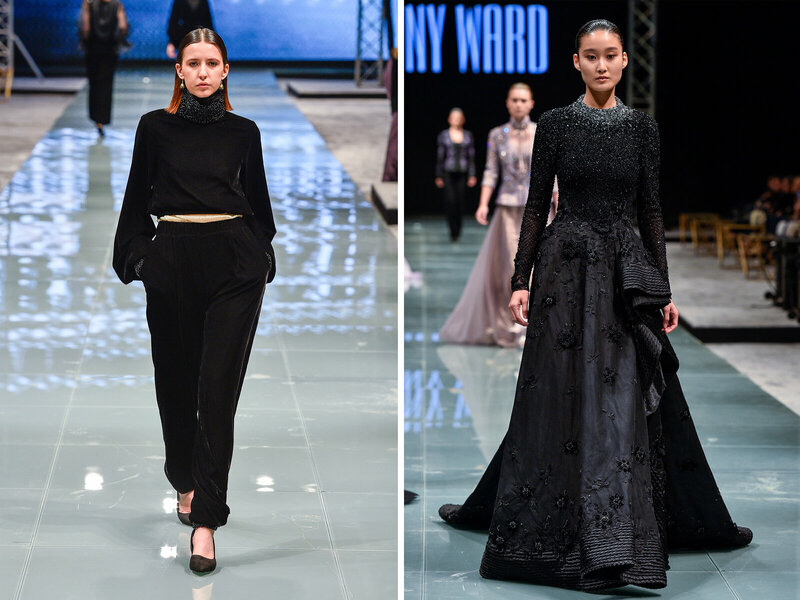 Ultra-feminine fashions by Bibisara (left) and Tony Ward. These are fashions Saudi women might wear in private. In public they usually don a black, loose-fitting, floor-length cloak called an abaya. Saudi women regularly attend fashion weeks in New York, Paris and Milan. But the kingdom is still highly conservative and there are restrictions on what types of clothes can be exhibited at the Riyadh show — no cleavage, nothing above the knee and nothing too transparent. The audience was female only. Organizers were the only ones allowed to take pictures inside the tent and photos have to be cleared by government censors before publication. Still, Lebanese designer Naja Saade says Saudi women have extravagant tastes and love lots of special details on their clothes. Jean Paul Gaultier was one of the big designers to participate in Saudi Arabia’s first Arab Fashion Week in Riyadh. Jacob Abrian, the CEO of the Arab Fashion Council, the Dubai-based company organizing the event, says Saudi princesses are the biggest collectors of haute couture in the world. Abrian says it’s not surprising Riyadh would see its own fashion week. “We decided to host a fashion week in Riyadh, considering the fact and the importance of Saudi Arabia as hub for the Arab world and as the most important markets in the Arab region for the fashion industry,” he says. He adds that the country’s relatively large young adult population and purchasing power are appealing for the industry. Organizers did not immediately release attendance numbers. On opening day, many seats were empty. Logistical problems — plus the $400-per-night ticket price — might have impeded a larger turnout. 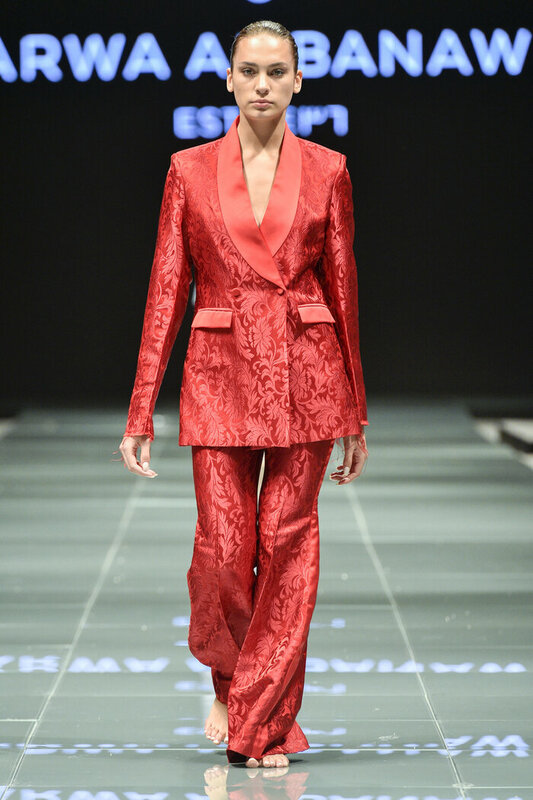 Arwa al-Banawi’s designs, including women’s business suits, send a strong message about female empowerment. The list of designers include big names like Jean Paul Gaultier. Most are from Europe or the Middle East, along with some from Brazil or the United States. Several are from Saudi Arabia, including Arwa al-Banawi. She says her designs, including women’s business suits, send a strong message about female empowerment at a time when Saudi Arabia is lifting harsh restrictions on women driving and working jobs. Banawi says it makes sense to have a fashion week in Saudi Arabia now because of all the changes happening in the kingdom. “It definitely is inspiring to me because women now want to become independent, they’re working,” she says. Even a couple of years ago, it would have been unthinkable for Saudi Arabia to host this kind of fashion event. Along with other moves like allowing movies and operas in, the government says it is trying to make the kingdom a more welcoming place for business and leisure. The effort is spearheaded by Crown Prince Mohammed bin Salman, who just returned from a nearly three-week visit to the U.S. to meet with President Trump and leaders in the financial, tech, and energy worlds. The government has recently taken strong steps to curb rampant corruption in the kingdom, including rounding up more than 200 of Saudi Arabia’s wealthiest and influential people and detaining them for about three months at the luxurious Ritz Carlton hotel — the same venue where Fashion Week is being held through Saturday. Organizers are planning another fashion event this fall, hoping to turn Riyadh into a regional hub for fashion.